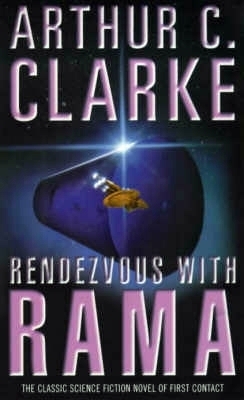 When I first wrote about the interstellar interloper now called ‘Oumuamua, I made reference to Arthur C. Clarke’s Rendezvous with Rama because of the delightful symmetry between the novel and the object, though noting that ‘we’re unlikely to find that A/2017 U1 is as intriguing as Clarke’s mysterious starship bound for the Magellanics’ (see An Interstellar Visitor?). Still, an interstellar object entering the Solar System only to go careening back out of it could not help but recall Clarke, whose ‘asteroid’ 31/439 wound up being artificial. Then came the paper from Karen Meech (University of Hawaii Institute for Astronomy, where the object was first detected with the Pan-STARRS1 telescope). Drawing on data from telescopes around the world, Meech’s team has been able to characterize our first nearby object from another stellar system, with equally delightful results. For it turns out that ‘Oumuamua (pronounced oh MOO-uh MOO-uh) has an unusual axis ratio, being about ten times longer than it is wide. Jim Benford couldn’t resist suggesting I show a cover from Rendezvous with Rama depicting just such an axis ratio, and I agreed wholeheartedly. Any science fiction fan familiar with Clarke (and are there any who aren’t?) will have fun with the similarities, but how much do we actually know about ‘Oumuamua? Meech’s team based its conclusions on the object’s shape on the fact that its brightness changed so dramatically as it rotated (spinning on its axis every 7.3 hours). Lance Benner, who specializes in radar imaging of near-Earth and main-belt asteroids at JPL, calls the axis ratio here ‘truly extraordinary.’ We know of no Solar System objects elongated more than 3 times longer than they are wide. Nothing in our Solar System, in other words, quite matches an object shaped like this. Of course, it might also look like the image below, courtesy of the European Southern Observatory. Image: This artist’s impression shows the first detected interstellar asteroid: `Oumuamua. This unique object was discovered on October 19, 2017 by the Pan-STARRS 1 telescope in Hawai`i. Subsequent observations from Gemini, ESO’s Very Large Telescope in Chile, CFHT, UKIRT, and other observatories around the world show that it was on a path which must have been travelling through interstellar space for millions of years before its chance encounter with our star system. `Oumuamua seems to be a dark red highly-elongated metallic or rocky object, about 400 meters long, and is unlike anything normally found in the Solar System. Credit: ESO/M. Kornmesser. The object’s dark red color is similar to Kuiper Belt objects, and the researchers believe it is dense and rocky or with high metal content, an asteroid that, according to this ESO news release, lacks significant amounts of water or ice, and one whose surface darkening and reddening is the result of millions of years of irradiation. Current length estimates are in the range of 400 meters. Both Hubble and Spitzer are also tracking the object the week of November 20, according to JPL. And here’s another science fictional bit: Preliminary orbital calculations show `Oumuamua came from the approximate direction of Vega, in the constellation Lyra. That just might recall Carl Sagan’s novel Contact, where a SETI signal containing data is found to be coming from Vega, 26 light years away, leading to the construction of a most unusual device. But there the similarities end: Our object is simply traveling too slow to have been sent from Vega, which would not have been nearby when `Oumuamua was there 300,000 years ago. Are we going to find more such visitors? Ejected comets and asteroids, forced into the deep through interactions with larger planets, may be relatively common. In fact, Robert Jedicke, who is part of the team working with Meech, estimates that a similar object, of similar size, is out there between the Earth and the Sun at any given time, up to perhaps 10 every year. If so, it will be surveys like Pan-STARRS and the future Large Synoptic Survey Telescope (LSST) that begin to compile statistics on the frequency of visitors like `Oumuamua. `Oumuamua is now traveling at 38.3 kilometers per second relative to the Sun, about 200 million kilometers from Earth, and will pass the orbit of Jupiter in May of 2018, headed in the general direction of the constellation Pegasus. We should be able to continue to refine its trajectory as it leaves the Solar System through mid-December, when it becomes too faint to detect. The paper is Meech et al., “A brief visit from a red and extremely elongated interstellar asteroid,” published online by Nature 20 November 2017 (abstract). They should have named it Rama! 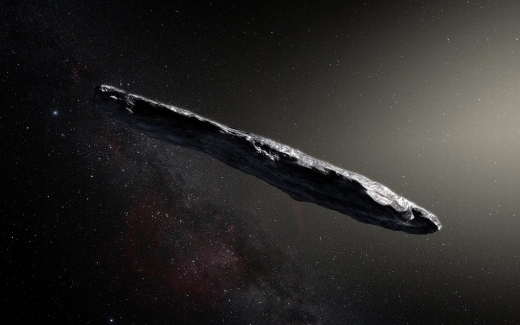 Astronomers estimate that an interstellar asteroid similar to `Oumuamua passes inside the orbit of Earth several times a year, but they are faint and hard to spot, so they have been missed up until now. It is only recently that survey telescopes, such as Pan-STARRS, are powerful enough to have a chance to discover them. “Our successful follow-up observations are a model for the future — especially when the next major survey telescope, LSST, comes on line,” added Meech. So is ‘Oumuamua truly rare, or just rare to humanity because we have not been able to detect them before? Do we have enough data to calculate the odds of how often a planetoid or comet from another star system may randomly pass through ours? How do we know how unusual is the makeup of this visitor if we have nothing else to compare it to? Well, the probability of an interstellar object’s trajectory passing “close” to the Sun & Earth + probability of its unusual shape. The last missing piece is a neon sign on the surface showing the middle finger. It’s really weird and maybe prescient that the Hawaiian name `Oumuamua is supposed to mean “messenger” or “scout”. I’m tempted to add “Bracewell probe”. What’s the chance of a natural asteroid achieving this shape? I found it to be astonishing. If the dimensions can be verified then it’s a real puzzle. That sort of object could give ample protection to organics or life on the long journey but at that velocity impacts would be very violent. I read about it’s unusual shape last night and was hoping Paul was going to post about it. I can’t wait to hear the comments! So it was rotating around it’s axis. Was it not tumbling? This is awesome! How would a natural process produce a long shape like this? Maybe the Allen Array will take some interest and take a look at it. What if it started slowing down? Wow, the questions I have! I think it is tumbling, since the aspect ratio was deduced from the light curve. Thanks, that makes since. If it is tumbling, that to me, would suggest that it is a natural object. I would think that a controlled object would maintain a constant position relative to its flight path as our space vehicles do. Maybe I could see if the tumble has a centrifugal purpose. Actually, a tumbling (or ‘rotating around a non-principal axis’) would be a very sensible thing for an unmanned alien probe. Say you want to pack a lot of different sorts of sensors into it, rather than having six of each type (to cover each direction), you just tumble the probe so that over the 7 hour rotation period, each sensor will be able to observe the vicinity. What are the constraints on its mass? 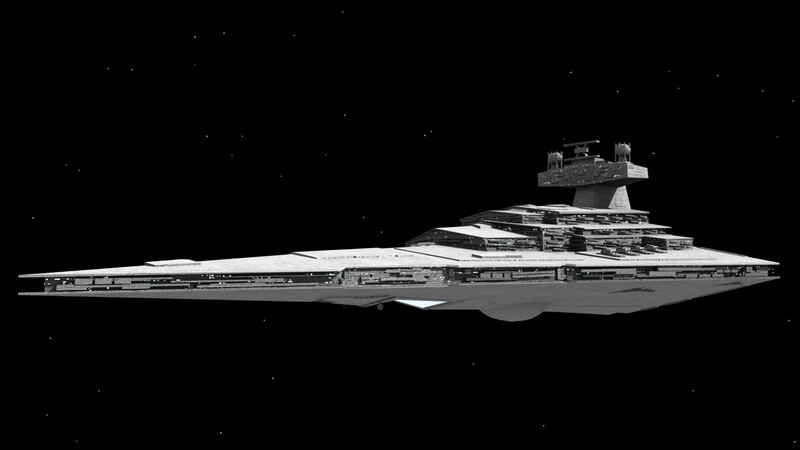 I calculate it would be 487,782,000-541,980,000 kg or 537,687-597,430 tons, depending on estimated size and assuming some marterial like basalt. This object has a much higher length to diameter ratio than either Rama or an O’Neill Island 3 cylinder. It is however, much lower than that of “The Way” in Greg Bear’s trilogy (Eon, Eternity, Legacy). Our first extra-solar visitor and it doesn’t look just like a normal object from its physical dimensions. I hope the calculation is correct that we could discover a lot more of these with better scopes. This makes a possible probe rendezvous far more likely in future. Is it possible these are the result of Oort cloud perturbations as stars pass close by? Could analysis of their compositions indicate previous stellar encounters? Wasn’t the object in the Greg Bear novels called Thistledown by its creators; or the Stone or the Potato, by the US and Soviets, respectively? I think “The Way” was the tunnel/ribbon boring through spacetime from the end of the craft itself. The obvious question to ask then, is what stars were in that location 300,000 years ago. 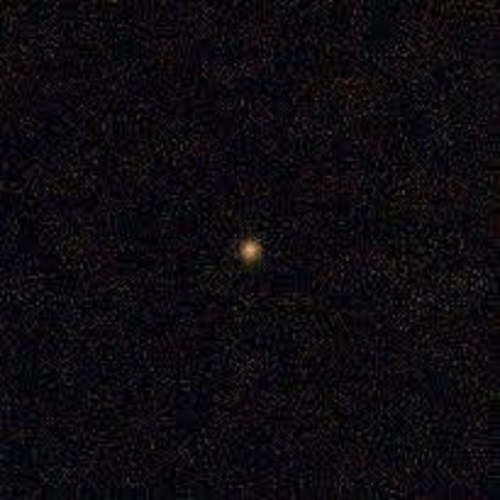 Or, more accurately, what stars were in it’s path at the time it passed any point along its current path. Could it have started its journey nearer or further than Vega? Alternatively could it be a probe ‘banking’ along a sequence of stars? For the second question, also it is important to know if the object changed from its expected path in any way after its closest approach to the Sun? Is the current path towards any other star? I don’t think we have a good enough trajectory to know. But the object should be viewable until mid-December, so perhaps we can tighten up the parameters and get some idea. Can Arecibo look at it? Or is it still out of commission? Arecibo may not be torn down any time soon, but it is still not working as an astronomical observatory two months after Hurricane Maria came through Puerto Rico. Perhaps China’s FAST radio observatory can do the job? I have posted this question here several times now: How much artificial gravity is produced at the END POINTS of a 400 meter object rotating once every eight hours? ANYONE? A tiny fraction of a g. For a 200m radius you would need a rotation rate of 2.12 rpm to get 1 Earth gravity. A very small fraction (under 1/10000) of a g. The forces go as rotation squared (w^^2 r). Still, enough to pull apart a fluffy snowball, which is (i think) is why most reports say it is rocky or metallic. Elongated or cylindrical asteroids are theorized to have been formed during accretion by two smaller asteroids that are close together revolving on a center of mass. Thank you. Would they still stick together if the combined body was tumbling at a period of 8 hours? I’m not even sure a column of solid rock would have enough tensile strength to stay in one piece. If the object were predominantly metal, some of which was FUSED by melting and re-solidifing as a result of some violent event during its creation, I would say, probably yes. However, assuming that astronomers’ calculations that its albedo is extremely low, even the above scenario would not prevent it from being broken to pieces during its closest passage to the Sun, where its surface temperature would reach well over 1,000 degrees farenheit, and tidal stresses due to its elongated shape would reach MAXIMUM(if any reader can compute this tidal stress, please do so and post the results HERE). That ratio would be closer to 2:1, 10:1 is unusual, maybe part of a lava field over laying softer regolith which was then ejected during a collision. Is it rotating along it’s long axis or short axis (which would be even odder). If this is an artificial object, this is the best look we’ll ever get of it – which sadly points out our extremely primitive technology. The direct descendant of the GCU Arbitrary, “My Name is Red” is more likely and of course it also failed to request Mr. David Bowie’s Space Oddity. But it now knows that the humpback whales are still here. WHEW!!!!! That was my first thought as well! I think Pirx’s object was toroidal. Why would it not be a good idea to maintain a few ‘off-the-rack’ probe payloads in a state of readiness, mothballed for quick response, to be able to respond nearly instantly to ‘target-of-opportunity’ missions like this? I know the space science types love to tailor-make one-off probes that are optimized for whatever they’re being sent to look at, but as I said, that lead time ensures that we could never, ever seize the moment when an unexpected gift like this comes along. Wouldn’t it be nice to have a few general-purpose probes on the shelf that could be put atop a Falcon Heavy or similar rapid response launcher and sent on their way within a few days or a week of detecting something interesting? Better a less-than-optimal mission than no mission at all. Maybe a production run of a half-dozen standardized payloads could even bring the price down a little. We could even maintain two varieties of standardized probes. Really stripped down, lightweight probes for high speed and longer range, and a bigger, heavier variant with more instrumentation. Of course, the problem is, who would be willing to underwrite such a project? It’s an investment, and one with a possibility of taking years or even decades to pay off, if ever, and that’s always a difficult sell. Elon Musk might be able to do this, but would he? This isn’t exactly along a direct line to his goal of making man a multi-planet species, and it would tie up some amount of capital he could probably use elsewhere. The space science types would seem to be the logical constituency, but they have so much trouble funding missions, I sadly don’t see them supporting an effort that might never generate any data, or any papers. We seem to be doing tolerably well these days with rapid-readiness launchers. To make this happen would need funding and support for probe payload design, construction, testing, storage, and maintenance. But if we *don’t* do this, we will never, ever be able to take advantage of opportunities like this, and who knows what we’ll miss? You would want it ready mounted on an all solid rocket, probably based on a current ICBM. That way you would be ready to launch almost immediately which you’d need given how short the reaction time to this thing was. You and I had similar thoughts (see my post below), and I’m sure a lot of people are thinking the same thing. Why launch from Earth if they could be space-based? Space based might have velocity/intercept trajectory advantage (I am not a GNC guy) and/or enabling a heavier sensorhead – assuming you could put a bigger one up with a large liquid ELV. But I think some major disadvantages of space based would more than offset that and include: keeping the rocket and sensorhead ready in space environment for long waiting periods, difficulty in upgrading the sensorhead when desired, initial cost, cost to keep it ready while waiting. So I think Earth basing would be the best choice and certainly in near term when you are trying to get even just a basic sensorhead up there. I would add that such a sensorhead could be developed to be specifically non-ITAR and compatible with large range of launch loads that it could therefore be offered (perhaps just the design if funds are tight) to other Space Agencies with suitable launchers in case they want to join in this quest. We only know its velocity after detection. If it is a thing-that-must-not-be-named, it might have decelerated from relativistic sometime prior to detection. Maybe look through records for a slight rise in, say, high energy particles in the weeks or months preceding? Exhaust, you know. This event should inspire us to develop the means to have a series of space probes, based in orbit, that can be quickly tasked to respond to unexpected events like Oumuamua. If we’d had a probe ready to intercept it, and get a closer look, and do so relatively quickly, that would be a highly useful capability. Let’s say that in the 2020s we build the Deep Space Gateway at one of the Lagrange Points. One of the roles it could function would be a support base for a small number of purpose-designed space probes designed to give us the means to respond to unexpected developments like this. The probes would have to have a common design, and have fast propulsion so they could reach a destination as quickly as possible. Solar-electric or nuclear-electric maybe. They would have common instrumentation to survey a newly discovered object. They would be designed to be based in space, and available ‘on-call’ when needed, so they’d need to have a sustainable power source. If based at the Gateway (I chose that on the assumption ISS won’t stay in orbit forever), they should be proximate so they can be serviced and upgraded when needed. We could even use CubeSat or Small Satellite technology to keep the cost down, allowing us more capability for money invested, or if we deploy one, we can quickly replace it. The main challenge is getting sufficiently high thrust so that it can close with and intercept an object as soon as possible, but have sufficient thrust to match velocity to do useful science. So we’re not talking chemical rockets. With Oumuamua we are stuck with distant observations. In the future when this happens again, we should have a spacecraft ready and waiting to give us a close up look. Another attempt to determine a system of origin: Dybczyński & Królikowska “On the dynamical history of the recently discovered interstellar object A/2017 U1 – where does it come from? Candidates within 30 pc include UCAC4 535-065571, Delta Capricorni and Gliese 876 (host to four planets but so far no detection of a debris disc). Definitely the most interesting astronomy story of the year! I don’t think we are going to be able to learn much more about this object. If the dimensions are accurate than it is an anomaly. In a way I would compare it to the Wow! signal. No one knows precisely what that was either. People will be discussing and debating Oumuamua for decades as they have for the Wow!. However when the LSST goes into operation in a few years and if objects with interstellar speeds and trajectories are routinely detected that would mean they are as common as David Jewett proposes and good evidence they are only ejected asteroids after all. That might not explain the anomalous dimensions. Someone’s going to post this eventually so it might as well be me. Enjoy. Having a beamer on standby would have been a real boon. Sending a StarChip swarm towards it at 0.2 c would hopefully produce impacts which could be spectroscopically analysed by others in the swarm and radio’d back, a la StarShot. We could make a start on building the beamer array right now, slowly filling it out over time. The laser itself could probe the structure and composition of the object and look at the isotopes which could be compared to nearby stars light spectrums. I wonder where this object is in reference to the Voyager probes. I read elsewhere that it is interesting it dipped into the habitable zone. So what if there are no signals? If it was trying to be low key it would hold off transmitting until well out into interstellar space right? Has its density been estimated? If so, how was this done and what were the results? If Oumuamua is artificial and there was some design behind its convoluted and unnaturally elongated shape, odd dust and ice-free composition and otherwise very fortuitous flyby of our odd little planet that has been emitting artificial radio signals and large amounts of visible light from its dark side for about 100 years, then the obvious origin might still be Vega. At 25 light years away, Vega is well within Earth’s growing radio/light bubble which is now about 100 light years in radius, and a civilisation there with much greater observation skills than ours might have been monitoring our output for decades (and hopefully enjoying David Bowie and not taking any drastic decisions based on our generally warlike nature, contempt for other species and fast advancing space technology). But, although travelling fast by solar system standards, Oumuamua is travelling far too slowly to have been sent from anywhere within that bubble in response to our signs of intelligent life. Unless, of course, said nearby advanced civilisation had also mastered the faster-than-light interstellar travel esential to so much of our sci-fi. ‘Warp drive’ anyone? At least one astrophysicist has mooted its theoretical possibility and compatibility with relativity theory: http://sydney.edu.au/news/physics_sifa/3134.html?newsstoryid=15346. You would have to slow down well before reaching your destination system if you were going to do any meaningful science – a leisurely 38kmps relative to us would be much more sensible (and safer for everyone, if Professor Lewis’s other prediction about coming out of warp drive is right!). So if it is artificial, Oumuamua’s current speed may not necessarily indicate how long it has taken to reach us from its home system. And the problem that Vega has moved a long way from Oumuamua’s apparent origin in the last 300,000 years is removed if the probe has actually taken only a few tens of years or less to get here. Although, if their observation skills really are that advanced, it might be a lot simpler and less expensive just to watch our TV. The space interloper ‘Oumuamua is spinning chaotically and will carry on doing so for more than a billion years. “At some point or another it’s been in a collision,” says Dr Wes Fraser from Queen’s University. His team’s latest study is featured in Sunday’s Sky At Night episode on the BBC and published in Nature Astronomy. It is yet another intriguing finding about this strange object that has fascinated scientists since its discovery back in October. ‘Oumuamua comes from a different star system. Its path across the sky confirms it does not originate in our solar neighbourhood. There is though, a new observatory coming that may change this game completely. It is called the Large Synoptic Survey Telescope and it will come online in the next couple of years. With its 8.4m primary mirror and super-digital camera, it will image the entire viewable sky from its position in Chile every few nights. If anything is moving across the sky, it will be hard to escape the attention of the LSST. “It is basically the perfect sort of tool to find objects like ‘Oumuamua. We expect to find 100s of them with the LSST,” Dr. Fraser says. On October 19, 2017, the Panoramic Survey Telescope and Rapid Response System-1 (Pan-STARRS-1) in Hawaii announced the first-ever detection of an interstellar asteroid, named 1I/2017 U1 (aka. ‘Oumuamua). Originally thought to be a comet, this interstellar visitor quickly became the focus of follow-up studies that sought to determine its origin, structure, composition, and rule out the possibility that it was an alien spacecraft! For the sake of their study, Lingam and Loeb constructed a three-body gravitational model, where the physics of three bodies are used to compute their respective trajectories and interactions with one another. It may already have arrived. Here’s how scientists are preparing for the next close encounter. “It ties really well into things that are being done anyway,” Laughlin says. In 2005 part of NASA’s Deep Impact mission plowed into Comet Tempel 1, ejecting some of the object’s innards into a debris cloud astronomers could study. Right now, NASA’s OSIRIS-REx mission is en route to Asteroid Bennu to retrieve a sample for return to Earth. And rocket technology is flourishing, as evidenced by SpaceX’s recent launch of the Falcon Heavy. If Pan-STARRS or LSST could spot an interloper and a mission like Deep Impact was ready and waiting to set off, something similar would be possible. I’d just like to make a quick observation regarding people’s perceptions of alien visitation. We all seem to have the belief that any aliens with the means to travel between the stars would be infallible. A lot of comments I have read about Oumuamua being a probe (even by scientists) discount the idea of Oumuamua being an artificial object because it isn’t giving off a signal etc. My belief is that it could be an derelict alien interstellar spaceship from millions of years ago, and the aliens made mistakes and somehow perished, ending up drifting off into space forever. Who knows what millions of years of interstellar dust accumulation would look like. Probably several meters of solid radiation baked rock by now. I think that If Oumuamua is an alien craft then this is the most likely situation. Sadly we may never find out.